House Zambia has a private swimming pool and a garden at the back of the traditional, newly built villa, which also contains a large terrace with a fully equipped kitchen and a barbecue (BBQ) grill. The high Cretan trees, vegetation and bamboo fences, shield the pool and garden's view completely from the neighbouring houses, providing complete privacy and beautiful green surroundings. Located in the quiet, traditional village of Prines in Rethymnon, Crete, House Zambia can accommodate 5+ people in its 2 spacious air-conditioned bedrooms, its fully equipped indoor kitchen and dining room and its comfortable living room with satellite TV. Relax inside or besides the pool, read a book under the shadow of the big oak tree in the garden, or organize a barbecue (BBQ) with your family and friends with fresh local meat from the village's excellent shops. House Zambia is ideal for a quiet, private getaway with your significant other, your friends or your family. The Bedrooms: House Zambia follows the traditional Cretan Greek village style with stone walls and traditional furniture, tablecloths, and ornaments. The house seamlessly combines traditional with modern elements to balance comfort and Cretan tradition in order to provide a memorable and authentic experience to all its guests. House Zambia's master bedroom contains a double bed and its secondary bedroom contains one double and one single bed. Both rooms are air-conditioned - which is something you definitely need during the famously hot Greek days and nights. Both bedrooms are located on the upper floor which also houses the indoors bathroom which apart from the toilet and the bathtub contains a family-sized washing machine. You don't have to worry about cleaning. House Zambia is professionally cleaned biweekly and all the towels and linen are changed. The Garden: The garden not only provides a great relaxing and serene background scenery, but it also provides a cool shadow shelter for those famously hot Greek afternoons. House Zambia's garden is full of Cretan flowers, plants and trees but its centrepiece is the large, glorious Oak tree at the edge of the garden, surrounded by a stone pedestal. Under the oak tree you can find a small coffee table, ideal for a relaxing chess or backgammon game amidst the guaranteed summer breeze of the garden. Overseeing the swimming pool and the garden is House Zambia's large terrace. The terrace houses a fully equipped kitchen with a Fridge and freezer, an electric Cooker and a Barbecue grill. You can organize a BBQ with family and friends with local, fresh Cretan meat you can buy directly from one of the village's butcher shops. The terrace also has a large dining table and is protected from the bright Greek midday sun with a tent. Coming to House Zambia: The village is very easy to find and access by car, but we can also meet you at the center of Rethymnon, in front of the town hall, or on the highway intersection of Rethymnon on the Heraklion-Chania national road. The village of Prines is less than 5 minutes from the aforementioned intersection, which is called 'Komvos Atsipopoulou'. You can take the exit towards the 'Atsipopoulo' location, which is clearly marked and follow the main road. Shortly you will be greeted by the village's name sign and arrive at Prines. House Zambia itself is less than 100 meters from the village's central square, on the traditional narrow path that's perpendicular to the main road. House Zambia has an indoors bathroom next to the two bedrooms, which apart from the toilet and the bathtub, also contains a family-sized washing machine. In addition the indoors bathroom, there is also a fully functional bathroom with shower enclosure and toilet outside the villa building close to the private swimming pool and the garden. Wireless Internet available for laptops and smart phones. We will give you the password as soon as you check in. House Zambia also includes: (1) bookcase with English books, (2) satellite TV, (3) DVD player with a large collection of movies, (4) kitchen utensils, (5) Cretan extra-virgin olive oil, vinegar, salt and pepper, oregano, (6) welcome bread, seasonal fruits, vegetables, and bottled water, (7) toaster, (8) microwave oven, (9) steam cooker, (10) coffee maker, (11) electric boiling pot, (12) TV in every bedroom, besides the living room, (13) hair drier, (14) electric mixer, (15) body soap, shampoo, and conditioner, (16) juice maker. I had stayed at the villa some years ago and was impressed by the location, standard of the villa and the care given by the owners, George and Tasoula. The return trip has been a joy, such a relaxing environment. the pool and outdoor area are private and sunfilled, with ample shade when needed. The family made us very welcome with a meal and supplies despite our late arrival. The villa is located in a small village but is only a short drive from the coast and main road. The tavernas in the village are excellent so there is no need to travel far for great food and hospitality. Perfect for recharging the batteries. A lovely, well equipped home. Peaceful and private garden. A welcome host with a lovely taste of Cretain cooking, a real treat having breakfast outside on the terrace every morning. Quaint , unspoilt village with friendly locals and lovely countryside. Take your walking boots!!!! Het huis was mooier dan de plaatjes doen vermoeden. De aankomst is al heel apart: het (rijtjes-)huis ligt aan een smal straatje in een klein dorpje, 50m van het dorpspleintje. Je leeft dus echt tussen de Griekse mensen. Dan kom je binnen in een hele grote ruimte met een zitgedeelte, een eetgedeelte en een keuken. Boven zijn 2 prachtige slaapkamers en de badkamer. Via de tuin kun je naar buiten en dan kom je in een oase van rust. Je vindt daar eerst een groot terras met keuken, waar wij steeds gegeten hebben; dan het zwembad, klein maar heerlijk en daarachter een tuin. Alles even ruim, mooi en verzorgd. De eigenaren lieten ons kennis maken met lokale gerechten en halverwege de week kwam een dame het hele huis schoonmaken. Echt een aanrader. located in a charming and friendly village in the hills above Rethymnon the villa was excellent, with all the necessary amenities, and maid service twice during the 9 days of our stay. The owner was very kind, providing us information as needed and she cooked a wonderful meal with a bottle of ice cold white wine to greet us on our late night arrival. She then brought round a second even more tasty meal half way through our stay. The village location was lovely, quiet, with a beautiful garden with fruit trees, roses and many flowers, backing on to an olive grove, with plenty of sitting places and an enormous terrace with a 2nd kitchen. The village taverna at the of the road was very friendly and served excellent food under the trees in the village square. 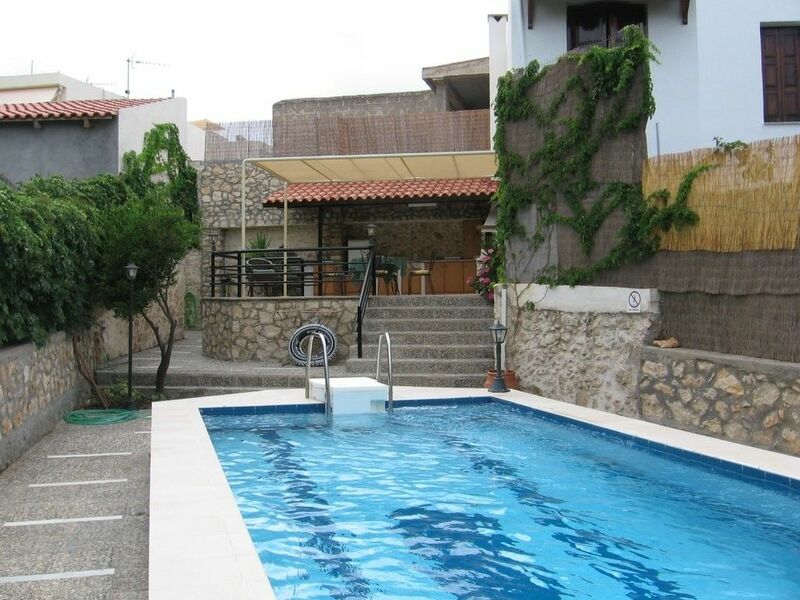 the village of Prines is an easy 15 minutes from the beaches and the town of Rethymnon. Location très confortable et spacieuse. Propriétaires attentifs et discrets à la fois. Merci à Anastasia pour sa cuisine crétoise fort appréciée. La piscine a été très sollicitée car la chaleur en Crête est énorme! Peut-être serait-il utile de mettre un parasol à disposition des locataires qui veulent aller à la plage, car il est impossible de rester sur le sable à découvert! Merci à Anastasia et son mari pour leur accueil et leur disponibilité. Un grand merci à Anastasia et Ionnis pour leur accueil chaleureux. Un repas d'accueil nous attendait ainsi que des boissons et fruits et légumes ; une attention qui nous a touché. La maison est conforme à l'annonce et très propre. Les propriétaires sont à l'écoute de leurs hôtes. Le village est très agréable aussi et nous avons aussi été touchés par l'hospitalité et la générosité des habitants. Nous y reviendrons sans hésitations et nous recommandons cette merveilleuse maison de vacances. Un grand merci à vous deux pour ce merveilleux séjour. Located in the old settlement of Prines, Rethymnon, Crete, Greece. The area is very quiet and retains its traditional characteristics. The location makes House Zambia an ideal holiday retreat for those seeking relaxation but also for those that want to explore Crete with its outstanding beaches, enchanting gorges and caves, and its mysterious ancient ruins - remainders of the Minoan and Venetian civilizations. The village of Prines is seven (7) minutes away from the centre of the town of Rethymnon (central Crete) and another seven (7) minutes away from the beautiful beach of Episkopi. All the other parts of Crete, Chania, Heraklion, and Agios Nikolaos are just a short drive away. Specifically, Chania is 40 minutes away, Heraklion 1 hour, and Agios Nikolaos 1 hour and 40 minutes. Although there is public transportation available to tour around Crete we highly recommend that you rent a car as this is the most convenient and quick way to explore Crete.